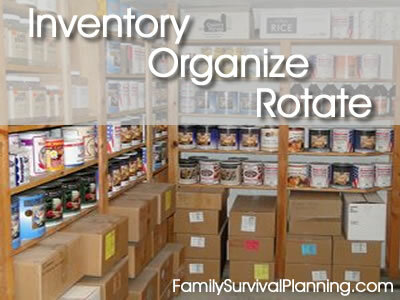 We all would love our food storage to be organized, easy to rotate, and to know exactly how much inventory we have. I know I dream of a perfectly built storage room with those expensive shelves that just let the oldest cans roll down to the front of the shelf so I know I'm rotating my foods properly. Yes, I can dream, but short of that perfection, just a little organization can make food storage workable. We can waste a lot of food, money, and time if we don't know exactly what's in our food storage and where it's located. If you are inventorying ALL your supplies, those that are not food do not need a purchase date. Go through every single item you have stored. While you have everything pulled out, use a black permanent marker to write the purchase date on every can or box of food. This is SO important for rotating food products. I keep a marker handy in my kitchen and when I bring home groceries, I write the dates on items that will go into my storage. Since I'm kind of a planning nut, I have looked high and low for what I consider the perfect preparedness planner where I can keep track of everything - food, water, personal information, bug out bag supplies - all of it. I finally found this one at SelfReliantSchool.com that works great for my needs. It includes 87 pages of information, lists and worksheets that help to plan meals, know exactly what items I have and need to buy for storage, plus worksheets to help keep everything rotated. Organize by putting all the canned fruit in one place, the canned vegetables in another, the canned soups in another. Organize by storage method - all canned items on one set of shelves, all freeze-dried cans on another. The method really depends on how your home is set up. I have a basement where I have dedicated one large room to ALL my survival supplies and food. Others may not have a basement or any large space to dedicate just to emergency supplies. If you don't have that kind of storage space, it is even more important to organize and take an inventory that is written down and kept up to date. As you all know, different foods have varying expiration dates or shelf life. The shelf life also depends on the method used to preserve the food. Most freeze-dried foods have a shelf life of 10-30 years. Home canned foods have a shelf life about the same as store-bought canned foods; however, it depends on the safety of canning methods used and personal choice about taking risks of eating food older than 1-3 years. For more detailed information on the shelf life of foods, visit Long Term Food Shelf Life and Food Shelf Life for shorter term and perishable foods. The point is that you should have a method of rotating your food storage — yes, even the wheat that has a shelf life of 30 years. The sooner you use a product, the more nutritious it will be for your family. The method you adopt for rotating food can be as simple as writing dates on cans, to scrupulously keeping your inventory sheets up to date. If you're really ambitious, you can expand your inventory sheet to include products you need (what you feel is vital, that you are lacking) and what you plan to acquire (what you plan to do within, say, the next 6 months-year to improve your preparedness). To meet your own goals, whether it is to acquire three month's worth of food or three year's, this should be an ongoing effort of planning and acquiring food, water, warm clothing/bedding, fuel, and, cash emergency funds. Food Storage Containers - What types and how to pack. Choose your containers, then learn How to use Oxygen Absorbers in those containers.